Own A Luxury Lifestyle Inspired by Calyx. Buy a sophisticated apartment in Calyx Kiara and enjoy your housing dreams! Home enthusiasts looking for a comfortable abode in Pune must have a look at Calyx Kiara, one of the latest presentations of Calyx. If you are on the hunt for quality homes, you will find your dream residence here. 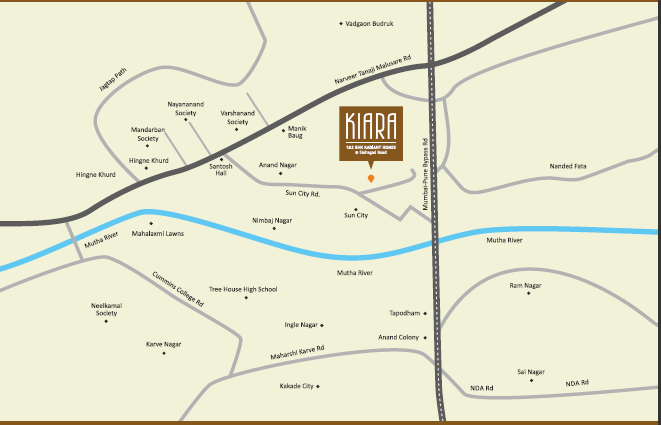 Centrally located in Pune, the residential estate will refine your lifestyle. Well, Pune has always been an attraction for homeowners, due to its commercial importance. The estate comes with all the amenities you would like to have around you. The sophisticated apartments bring a perfect mix of luxury and comfort to the residents. You can go for the 1 and 2 BHK apartments & Shops in the residential complex. These have been developed for the high-end and mid-range buyers. The residential complex also offers commercial spaces. You can set up your stores in the complex, enjoying the location benefits of the estate. The locality has witnessed tremendous infrastructural growth in recent years. The roadways have been developed and transportation facilities in the area have been upgraded. The demand for property in this region is on the rise. Evidently, the Calyx Kiara price is likely to increase in the coming years. Presently, the apartments are priced between INR 35 Lacs - 57 Lacs* lakhs Investors from various parts of the country are willing to buy these apartments. The returns on selling property in Pune are high. You can invest in these properties now and make the best use of your financial resources. The apartments are sophisticated, loaded with lifestyle and fitness amenities. The apartments come with elegant interiors, with polished furnishings, that refine the looks. If you are inclined towards green living facilities, you will find the perfect destination here. The residential complex comes with a number of trees. The landscaped gardens and open spaces will mesmerise your mind. Transportation facilities in the region are well-developed. The residents can reach the commercial places in quick time through the dense network of roadways. A number of shopping malls, restaurants, bars and multiplexes are located close to the residential complex. Easy connectivity is one of the key reasons behind the high demand for apartments in Calyx Kiara Sinhagad Road. The educational and healthcare infrastructure in the city is well-developed. Several schools and hospitals are located in close proximity to the residential estate. The important schools in the area include Aaryans World School, Millennium National School, Vidyapratistan Public School, Pawar Public School, and Walnut School. The residents moving to the apartments in the residential complex will also enjoy quick connectivity to the important hospitals in the region, including Sharad hospital, Adate Hospital, Sahyadri Hospital, Galaxy Care Hospital, and Ranka Hospital. The residential complex comes with a wide range of amenities for the fitness enthusiasts. You can enjoy your time in the swimming pool, gym, and play various indoor and outdoor games. The apartments have uninterrupted water and power supply 24/7. Investors and homeowners willing to buy property in Sinhagad Road should go for these apartments. The estate brings you a classy living experience. Enjoy the sophistication and comfort of the apartments, while you remain close to the commercial areas. Sinhagad College - 4 Kms. MIT College - 7 Kms. Deenanath mngeshkar hospital - 4 Kms. Abhiruchi Mall - 3 Kms. Chandani Chowk - 8 Kms.